June 7, 2018: The TA1148 is a wide band 13 watt power amplifier that operates from 800 to 2500 MHz, offering up to 40 dB of gain across the band. 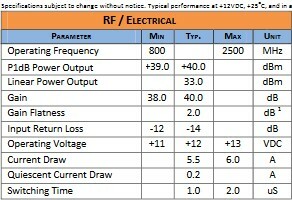 This amplifier also includes under/over voltage protection, reverse voltage protection, and is extremely linear across the operating frequency band. The TA1148 is in stock and available for same day shipping. This class A GaAs module is designed for both military and commercial applications. It is capable of supporting any signal type and modulation format, including but not limited to 3 - 4G telecom, WLAN, OFDM, DVB, and CW/AM/FM. 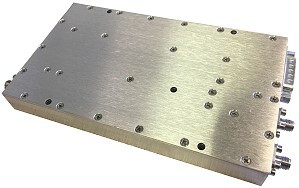 The latest device technologies and design methods are employed to offer high power density, efficiency, and linearity in a small, lightweight package. Features: Over temperature shutdown, Over / under / reverse voltage protection, Optional heatsink, Temperature output, Forward power measurement, High speed on/off control.